A new inspiration for change every day! Daily Awakenings create new ways of thinking and living, so your happiness, wisdom, creativity, and relationships deepen and grow. Words to Inspire Change alters our ways of thinking about personal change, creativity, and teaching. Everyday Enlightenment provides new ways of thinking which will alter your mind and change your life. Screwing Up Love or How to Make Love Grow and Last is a "wild romp through the brambles of love." Happiness Now. Don't wait for happiness to occur like magic. Make it a choice in your life. 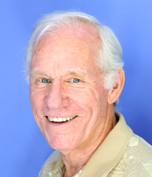 The 30 Second Therapy with Dr. Bob, The Happiness Coach. Give it a try! The Seven Life Principles reveal how we live in automatic, while thinking we are free. Woo Master Wisdom addresses questions about life by Kiro, a gentle Woo Master, who is wise, creative, and playful. Art Gallery is where you can see his abstract, playful, symbolic, and realistic paintings. Movies of the Mind nurtures greater control over thoughts that diminish your potential for greater happiness and peace of mind. Poems in Little Boxes are haiku written by Jim on various themes, including courage, life, love, and spirit. Tombstone Epitaphs give you a new perspective on your life. Moving Easy in the Harness. For those who carry a heavy burden of commitments and who suffer from the stress of carrying such a heavy load. Night Sea Journey: The Ordeal of Individuation (Createspace, 2018). This fascinating book is Jim's account of his personal transformation, which began on May 11, 1980 and lasted for 7 years. While it was an ordeal that tested him many times, it eventually healed him at a deep level. To buy the book or kindle version, go to Amazon.com. 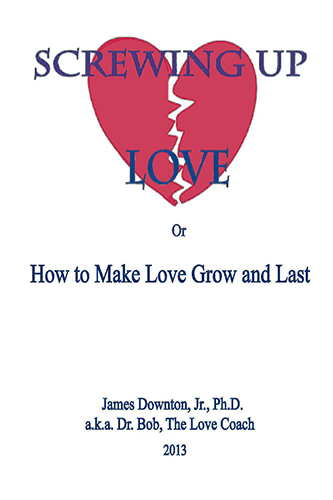 Screwing Up Love or How to Make Love Grow and Last (Createspace, 2013). With the help of Dr. Bob, the Love Coach, we learn what we do to screw up love and what we can do to make love grow and last. Dr. Bob's sense of humor and honesty makes this book a fun and engaging book to read. To learn more about the book, click on the cover.To buy the book or Kindle version, go to Amazon.com..
Today, I Will . . .Words to Inspire Positive Life Changes(Blue Mountains Arts, 2009) asks you to shift the way you think and to cultivate your amazing potential. Using declarations, each containing the words "I will," the book helps you focus on what's positive and good in your life. It steers you onto a path of self-improvement, inspiring you to be the person you've always wanted to be--one day at a time. To buy the book, go to Amazon.com. Why am I so DAMN Unhappy? (Robert Reed Publishers, 2008) is written from the viewpoint of an imaginary character called Dr. Bob the Happiness Coach. This is a must read for people who want more happiness in their lives and enjoy humor! To learn more about the book, click on the cover. To buy the book to Kindle version, go to Amazon.com. Blooming: Teachings of a Woo Master (Green Dragon Books, 2005) tells the story of Kiro, a humble gardener who taught Jim about Woo Way to help expand his wisdom, happiness, and inner peace. You will love Kiro for his playful spirit and simple wisdom! To learn more about the book, click on the cover. To buy as an e-book, go to Amazon.com. To buy as a paperback, go to Green Dragon Books . The Woo Way: A New Way of Living and Being (Green Dragon Books, 2003) cultivates more awareness, choice, balance, and wisdom. This is a groundbreaking book about personal transformation. It will change your life! To learn more about the book, click on the cover. To buy the book, go to Amazon.com. Playful Mind: Bringing Creativity to Life (Green Dragon Books, 2003) adds more creativity, adventure, fun, and fulfillment to life. If you want to become a more creative person in all aspects of your life, this book is for you! To learn more about the book, click on the cover. To buy a paperback or e-book, go to Amazon.com. Awakening Minds: The Power of Creativity in Teaching (Green Dragon Books, 2003) increases a teacher's creativity, effectiveness, and enjoyment of teaching. This book is for middle school, high school, and college teachers who are looking for more innovative ways to teach so they can feel more fulfilled while teaching. To learn more about the book, click on the cover. To buy the paper back book, click on Green Dragon Books.To buy the e-book, click on Green Dragon Books.